To report clinical and functional results of ACL reconstruction in patients over 50 years old and investigate the influence of surgery on osteoarthritis progression in this cohort of patients. A systematic review was performed on PubMed, Scopus, Google scholar, Cochrane library and EMBASE, using a strategy search design to collect clinical studies reporting outcomes of ACL reconstruction in patients aged 50 years or older. The primary outcome measure was clinical and functional results, including failure rate defined as reoperation for revision ACL surgery or conversion to total knee arthroplasty; secondary outcomes included radiological findings, expressed according to the validated grading score. A total of 16 studies were found suitable and included. Overall, 470 arthroscopic ACL reconstructions were performed in 468 patients (278 males, 190 females), with a mean age of 53.6 years (50–75 years). The total failure rate, described as reoperation for revision ACL surgery was 2.7% (10 knees), ranging from 0 to 14.3% in the selected studies. All papers reviewed showed a statistically significant improvement of clinical and functional scores at final follow-up, comparable to younger control group, when reported. Post-operative objective stability testing with KT-1000 arthrometer device or equivalent was performed in seven studies, with a mean side-to-side difference of 2.2 mm (0.2–2.7 mm). Radiographic signs of progression of osteoarthritis were reported in six studies, where severe signs of degeneration (grade 3 or 4 according Kellgren–Lawrence or Ahlbäck classification) shifted from 4 out of 216 knees (1.9%) before surgery to 28 out of 187 knees (15%) following ACL reconstruction, after a mean period of follow-up ranging from 32 to 64 months. ACL reconstruction in patients older than 50 years is a safe procedure with good results that are comparable to those of younger patients previously reported. Age itself is not a contraindication to ACL surgery because physiological age, clinical symptoms and functional requests are more important than chronological age in decision process. 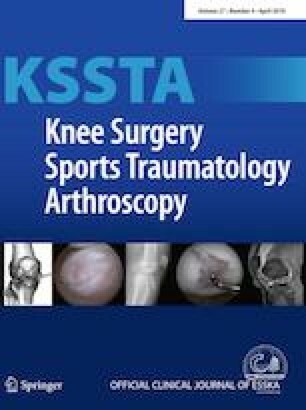 Since cohort size in the present study is not large enough, and taking into account the high occurrence of concomitant meniscal and chondral lesions, more high-quality studies are necessary to draw definitive conclusions about development of osteoarthritis of the knee after ACL surgery in these patients. No external funding was received for the initiation or completion of this study. An institutional review board was not obtained because all data were extracted from previously published studies.